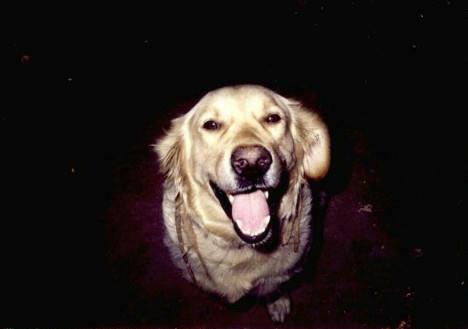 Shawny, my dog, my companion & my best friend of almost 11 years died last afternoon. She had not been well for the past few days. It started with her just not eating enough, then very little at all. She became quite and not as active as she normally is. My dad & I thought it was just something she ate that upset her; she did tend to eat rotten fruit that fell from the trees in our yard. Then she stopped coming to greet me when I came home from work late at night. This Saturday when I went to her kennel, she only wagged her tail when I called her name but didn’t even lift her head and her back was turned away from me. My dad & I decided to get a vet but he could come to see her only on Monday. He said she had an infection from a fever like pneumonia or something. I went to get medicines for her and we though she would recover from rest & the meds. My dad gave her the dose on Tuesday morning and told me to give her some milk mixed with water. She hadn’t eaten anything except maybe some gruel water. She was drinking water. She kept whinning when I went to give her the milk but she couldn’t get up. Then later that afternoon when I went to check on her, I found her lifeless body. I can’t remember crying this hard and I broke down. My uncle got some guy to come and dig a grave for her to the side of my house and we buried her there. As they guy was filling up her grave, I spotted her bowl – the aluminium bowl we gave her food in. Shawny loved to play with the bowl, often tipping it over even when I filed it with water and carry it in her mouth. It was her way of playing with me or my dad. She would also bring it to the top of the stairs outside the front door at night and drop it so it hit every step on the way down, making a loud racket and wake my parents and me. Seeing the bowl, I picked it up and dropped it next to her in the grave. I’ll never get another dog again in my life. Wouldn’t be fair. Shawny was more than a dog to me, she was my best friend. I am a dreamer, I dream about fanstic voyages, through space, through different planets & stars & distant galaxies in spaceships manned by anderoids & humans. I have thrilling adventures that are so exciting – and in each one, by side was Shawny. She can never be replaced. I am an athiest so I don’t belive in heaven. Who knows what happens after death right? But I know, that if there is an afterlife or something of that sort, when it’s my turn to die, waiting fro me on the other side will be the best, most beautiful Golden Retriver in the world – my Shawny! Reading this just about broke my heart. Have you truly not gotten another dog after all this time? I don’t know that I could stop sharing my life with dogs but I can’t imagine how devastated I will be when it’s my guys’ time to go. Have you ever read the story of the Rainbow Bridge? Thanks for the lovely comment Lara. I’ve taken care of my sister’s dog for a year (me, my mom & dad in our previous home) and she (the pup) was a hoot to be around. But no, I will never get over my beloved Shawny – she was a one in a billion. She’s as fresh in my heart & my mind now as she was when she was alive. I loved that pooch so much and I still love her. My heart always feels a pulling on it’s strings whenever I see a golden lab or retriever. I too have a dog, a lab. And I can imagine what the loss must have been. When we bring them into our lives, we never know the depth of the attachment that may sprout between them and us. And when they leave us, nothing will be more painful, since it’s the absence of unconditional love that follows. How wonderfully said Vidya. That is what it felt; absence of unconditional love. She passed away in 2005 but not a day goes by without me missing her or thinking about her. She can never be replaced. I miss her everyday. Not a single days goes by without me thinking of her for a couple of hours atleast.